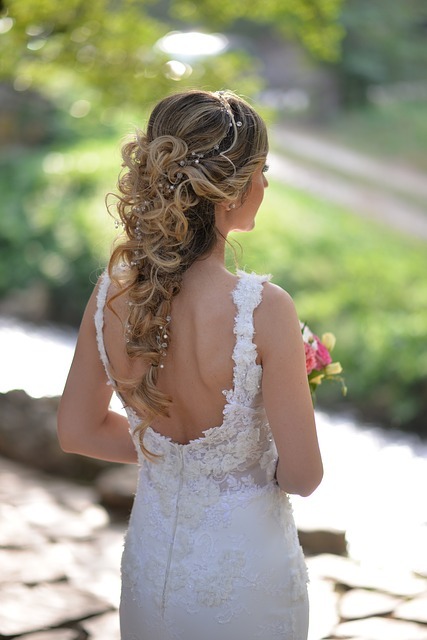 When finding your bridal hairstylist choose someone who’s well versed in a variety of different styles and genres. A great hairstylist will know many techniques and have the skills to achieve any desired look. Look for someone who specializes in bridal hair. Having a trial with a thorough consultation will definitely ensure beautiful hair. It’s a great way for you to interact with the stylist to see if your personalities mesh. You’re not looking for a friendship, rather you’re looking for someone who listens and understands what you’re looking for. On the day of your trial bring in photos of hairstyles you like. They can be pictures of brides, celebrities, models- anyone whose look inspires you. Your hair trial gives you the chance to try out a look and discover whether or not you feel comfortable with it. Consider your hairstylist’s suggestions, she’s the expert, but don’t feel too pressured to follow her advice. However, you might as well give it a shot since you have her expertise at your fingertips. That’s what trials are for. There are so many great hair accessories available to add a gorgeous accent to your wedding hair. Depending on the look you’re going for you can wear a brooch, jeweled barrettes, feathers, bird-cage veils, and flowers to name a few. Having a creative hairstylist who can mean endless possibilities. Don’t shy away from having hair extensions for your wedding. Extensions are great if you want to add more length or fullness. A great hairstylist will be able to put them in and have them stay put all day and well into the evening. In order to have beautiful hair your hair needs to be in tip-top shape. Continue having regular haircuts and make sure your cut is suited to the style you want. Long layers work best for most hairstyles. Also if your hair is dry opt to have deep conditioning treatments at least two weeks before your wedding date. Consult with your hairstylist for a custom regimen. Right before your wedding that is. It’s better to be safe than sorry, so avoid cutting your hair close to your wedding. Especially avoid a radical change of style. Be product free on the day of. Your hairstylist will love you for showing up with clean blown dried hair on your wedding day! Make sure you wash it at least a day before. If it rains or a strong wind decides to show up on your wedding day, and that down style you had you heart set on just isn’t working. Don’t panic – last minute changes are okay, as long as you and your hair stylist are prepared. And if you’ve done your homework as advised then you shouldn’t have any problems.